Amazon opens “Amazon Storefronts,” a new store for customers to shop exclusively from U.S. small and medium-sized businesses selling on Amazon. SEATTLE--(BUSINESS WIRE)--(NASDAQ:AMZN) – Today, Amazon opens “Amazon Storefronts,” a new store for customers to shop exclusively from U.S. small and medium-sized businesses selling on Amazon. 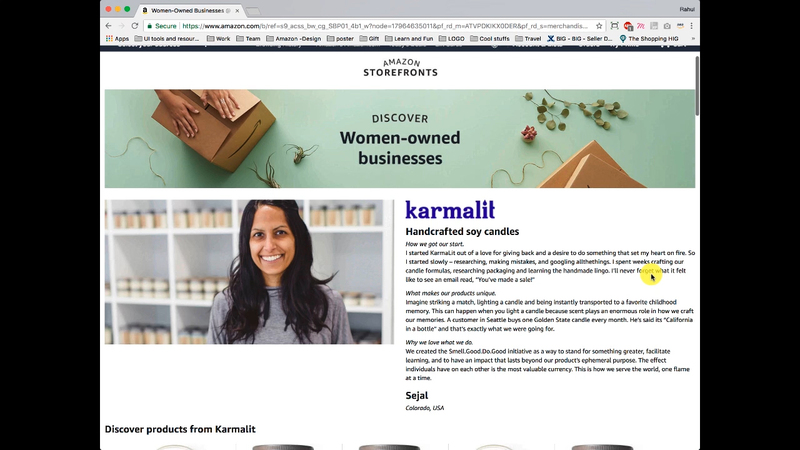 With Storefronts, customers can shop a curated collection of over one million products, and deals from nearly 20,000 U.S. small and medium-sized businesses, and learn more about profiled businesses through featured videos and stories. Amazon launched the new store to offer customers an easy way to buy from small and medium-sized businesses in all 50 states through the convenient and trusted Amazon experience. Amazon Storefronts features a variety of product categories including Back to School, Halloween, Home, Kitchen, Pet Supplies and Books. Curated American Collections: Customers will enjoy shopping from more than 25 product categories to discover unique items from U.S. innovators, artisans, entrepreneurs and more, including products like a matching Halloween pajama set for the family, wooden name puzzles and protein sandwich cookies. Storefront of the Week: Each week the store will highlight a featured U.S. business through a fun video to help introduce the many faces and types of businesses that customers are shopping from on Amazon Storefronts. Meet the Business Owner: Rotating exploratory feature that profiles U.S. small and medium-sized businesses selling on Amazon. At launch, customers can learn and browse more than a dozen businesses that are Family-focused, Artisans, Innovator-Makers and Women-owned Businesses. To find Storefronts from the Amazon.com homepage, customers can click on the rotating banner featuring a U.S. business, or navigate to the store directly at www.amazon.com/storefronts. 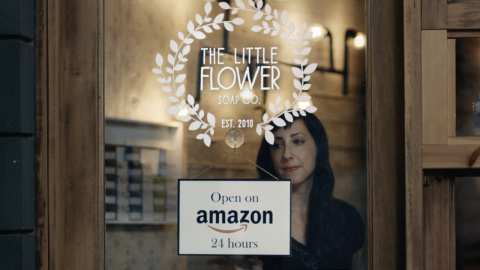 To support the launch of the new store, Amazon is unveiling its first-ever national TV commercial featuring real businesses that sell on Amazon. With more than a million small and medium-sized businesses in the U.S. selling on Amazon, the ad gives customers a glimpse into a real business on Amazon and how Amazon is actually a 'Big collection of Small.' The commercial shows how Amazon helps businesses get their products to customers all over the world. To help illustrate the growing number of businesses on Amazon, a series of business logos come together at the end of the ad to form the Amazon smile logo. To view the ad, click here. Earlier this year, Amazon introduced the Small Business Impact Report. According to the report, small and medium-sized businesses selling on Amazon are estimated to have created more than 900,000 jobs worldwide. In 2017, more than 300,000 U.S.-based small and medium-sized businesses started selling on Amazon. To view the report, visit: www.amazon.com/SMBreport. To explore Amazon Storefronts and watch videos about small and medium-sized businesses on Amazon, click here.